Frances Perkins, an economist and social worker, served in Roosevelt's gubernatorial administration as Industrial Commissioner and became the first female cabinet member when FDR appointed her Secretary of Labor, a position she held throughout Roosevelt's presidency. Perkins was born in Boston April 10, 1880 and christened Fannie Coralie Perkins. (She later legally changed her name to Frances Perkins and in 1913 when she married Paul Caldwell Wilson, she refused to take his name, subsequently defending her right to her own name in court.) She spent her childhood in Worcester, Massachusetts and with the strong support of her father enrolled in the overwhelmingly male Worcester Classical High School. While attending Mount Holyoke College, Perkins read Jacob Riis's How The Other Half Lives, studied economics, and met National Consumers League secretary Florence Kelley. After graduation, Perkins divided her time between a series of part-time teaching positions and volunteer work with a variety of Worcester social service organizations. In 1904 she accepted a teaching position in Lake Forest, Illinois and quickly began spending her free time at Hull House and other Chicago settlement communities. Three years later, she moved east to study economics and sociology at the University of Pennsylvania. After receiving a Russell Sage Foundation fellowship, she moved to New York in the summer of 1909 to survey living and work conditions in Hell's Kitchen. The following year she was elected secretary of the National Consumers League. Perkins witnessed the March 25, 1911 Triangle Shirtwaist Factory Fire and watched the trapped young women pray before they leapt off the window ledges into the streets below. Her incessant work for minimum hours legislation encouraged Al Smith to appoint her to the Committee on Safety of the City of New York under whose authority she visited workplaces, exposed hazardous practices, and championed legislative reforms. Smith rewarded her work by appointing her to the State Industrial Commission in 1918 and naming her its chair in 1926. Two years later, FDR would promote her to Industrial Commissioner of New York. Molly Dewson, Jane Addams and others campaigned for Perkins to be Secretary of Labor and urged ER to help secure the position for her. Perkins, convinced that a person from organized labor should hold the post, initially refused and suggested a woman trade unionist instead. The pressure on her to accept the position increased, and after telling FDR that she expected the administration to side with liberal labor practices and that she wanted to spend weekends in New York with her family, she accepted the position. Labor objected, arguing that she had no experience with unions and little ties with the labor movement, but she defused their opposition by downplaying her position and praising the role of AFL president William Green. As a key labor advisor to FDR, she helped shape the Civilian Conservation Corps, the Federal Emergency Relief Administration, the National Labor Relations Act, the Social Security Act and the Fair Labor Standards Act. She also shepherded the United States' entry into the International Labor Organization, and remained its active supporter throughout her life. She resigned July 1, 1945 so that Truman could appoint Lew Schwellenbach. Later that fall, Truman denied her request for an appointment to the Social Security Board, naming her instead to the Civil Service Commission, a position she held until 1953. Devoted to Roosevelt, she defended his record in her 1946 memoir, The Roosevelt I Knew, and in public lectures. 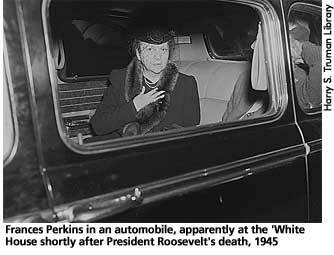 In 1957, the seventy-seven year old Perkins joined the faculty of Cornell University's School of Industrial and Labor Relations, a position she held until her death on May 14, 1965. Green, Carol Hurd, ed. Notable American Women: The Modern Period. Cambridge: Harvard University Press, 19--, 535-539. Martin, George. Madam Secretary. New York: Putnam, 1976, passim.